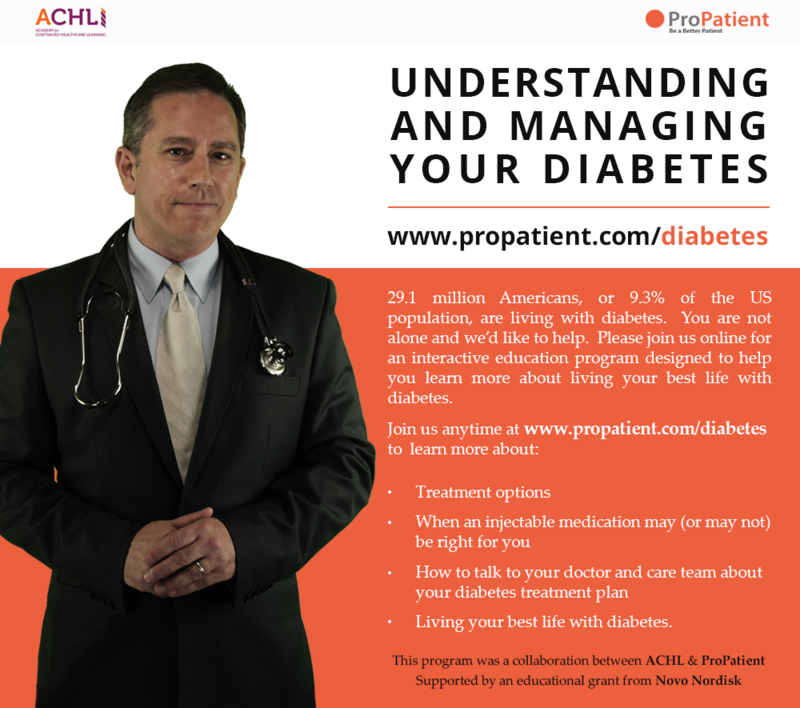 Hillsborough, NC, November 29, 2016	(Newswire.com) - ​​ProPatient, a provider of interactive online patient education tools is teaming up with leading accredited medical education provider, the Academy for Continued Healthcare Learning (ACHL), to develop a unique and interactive online resource for people managing diabetes. Diabetes is characterized as a condition in which the body’s ability to produce or respond to the hormone insulin is impaired, resulting in abnormal metabolism of carbohydrates and elevated levels of glucose in the blood and urine. As of 2015, an estimated 415 million people have diabetes worldwide, with type 2 diabetes making up about 90% of the cases. ACHL is a leading innovator in providing relevant education to enhance healthcare delivery and patient outcomes. 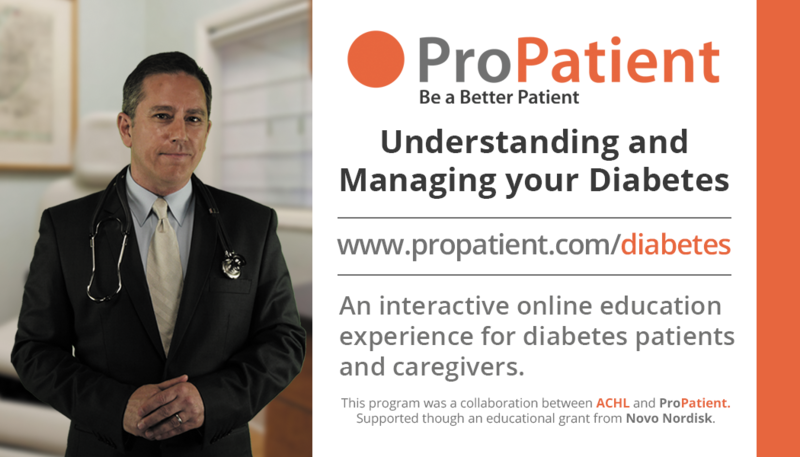 In partnership with ProPatient, they are expanding their current offerings of online simulations to their portfolio of educational programs to include patients. The program entitled, “Understanding And Managing Your Diabetes,” is an interactive program that discusses type 2 diabetes and methods for managing it. It explains current treatment options, common misperceptions about injectable therapies, the benefits of lifestyle modification, and the importance of adherence to proper treatments in order to achieve optimal disease management. It provides the tools for patients to effectively start communicating with healthcare providers, family, and friends about the condition. 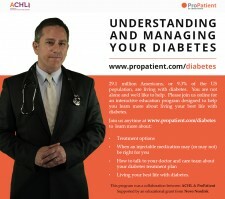 ProPatient is a patient-focused, online educational platform that utilizes interactive video and engaging simulation to provide patients with the opportunity to ask questions of a virtual clinician and role-play different scenarios to improve their skills. The ProPatient mobile app is the companion app for your doctor visit, reminding you of the questions you should be asking during your doctor visit and providing checklists of items to consider in the event of a health condition or crisis. You are the CEO of your own health. You need to take Charge. We can help. ACHL is an-award winning provider of continuing medical education (CME) programs. Its mission is to design, develop, and implement quality continuing education activities that have a positive influence on the way healthcare is practiced and ultimately, to improve the quality of care provided to patients. ACHL serves its mission by designing directly-sponsored and jointly-sponsored educational activities using a variety of educational methods, media, and approaches. ACHL is accredited with Commendation from the Accreditation Council for Continuing Medical Education (ACCME). This achievement places ACHL in the highest tier of all CME providers.